Silicon carbide (SiC), also known as carborundum, is a compound of silicon and carbon with chemical formula SiC. It occurs in nature as the extremely rare mineral moissanite. Silicon carbide powder has been mass-produced since 1893 for use as an abrasive. Grains of silicon carbide can be bonded together by sintering to form very hard ceramics which are widely used in applications requiring high endurance, such as car brakes, car clutches and ceramic plates in bulletproof vests. Electronic applications of silicon carbide as light emitting diodes (LEDs) and detectors in early radios were first demonstrated around 1907, and today SiC is widely used in high-temperature/high-voltage semiconductor electronics. Large single crystals of silicon carbide can be grown by the Lely method; they can be cut into gems known as synthetic moissanite. Silicon carbide with high surface area can be produced from SiO2 contained in plant material. Because of the rarity of natural moissanite, most silicon carbide is synthetic. 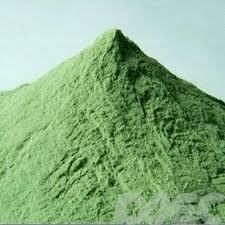 It is used as an abrasive, and more recently as a semiconductor and diamond simulant of gem quality. The simplest manufacturing process is to combine silica sand and carbon in an Acheson graphite electric resistance furnace at a high temperature, between 1600 and 2500 °C. Fine SiO2 particles in plant material (e.g. rice husks) can be converted to SiC by heating in the excess carbon from the organic material.The silica fume, which is a byproduct of producing silicon metal and ferrosilicon alloys, also can be converted to SiC by heating with graphite at 1500 °C. Synthetic SiC Lely crystalsThe material formed in the Acheson furnace varies in purity, according to its distance from the graphite resistor heat source. Colorless, pale yellow and green crystals have the highest purity and are found closest to the resistor. The color changes to blue and black at greater distance from the resistor, and these darker crystals are less pure. Nitrogen and aluminium are common impurities, and they affect the electrical conductivity of SiC. Pure silicon carbide can be made by the so-called Lely process,in which SiC powder is sublimated in argon atmosphere at 2500 °C and redeposited into flake-like single crystals,sized up to 2×2 cm2, at a slightly colder substrate. This process yields high-quality single crystals, mostly of 6H-SiC phase (because of high growth temperature). A modified Lely process involving induction heating in graphite crucibles yields even larger single crystals of 4 inches (10 cm) in diameter, having a section 81 times larger compared to the conventional Lely process.Cubic SiC is usually grown by the more expensive process of chemical vapor deposition (CVD).Homoepitaxial and heteroepitaxial SiC layers can be grown employing both gas and liquid phase approaches.Pure silicon carbide can also be prepared by the thermal decomposition of a polymer, poly(methylsilyne), under an inert atmosphere at low temperatures. Relative to the CVD process, the pyrolysis method is advantageous because the polymer can be formed into various shapes prior to thermalization into the ceramic. Abrasives & Cutting Tools: In the arts, silicon carbide is a popular abrasive in modern lapidary due to the durability and low cost of the material. In manufacturing, it is used for its hardness in abrasive machining processes such as grinding, honing, water-jet cutting and sandblasting. Particles of silicon carbide are laminated to paper to create sandpapers and the grip tape on skateboards. In 1982 an exceptionally strong composite of aluminium oxide and silicon carbide whiskers was discovered. Development of this laboratory-produced composite to a commercial product took only three years. In 1985, the first commercial cutting tools made from this alumina and silicon carbide whisker-reinforced composite were introduced by the Advanced Composite Materials Corporation (ACMC) and Greenleaf Corporation.